Welcome to Poolsremoved.com and thank you for considering us! This website is intended to help you in reaching a decision to have your swimming pool demolished / removed. Demolition or removal of swimming pools is not a service that you can simply ask your co-workers or friends what to expect, so I have designed this website to help you have a better understanding of our process and what we’re about. 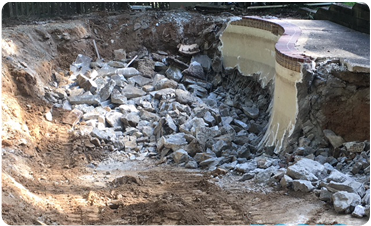 I was the first contractor to offer swimming pool demolition and removal as an exclusive service in Maryland and northern Virginia. We are a small company and I personally oversee each and every job we perform. I am on site for the entire duration. I choose to stay a small operation to maintain high quality. I take a huge amount of pride in the integrity of our service. The decision to put a swimming pool to rest is very personal and sometimes a sensitive decision for many of our clients. With that said, I operate with an old school mentality, I make it a point to communicate in an honest, upfront, and transparent manner with all clients. You can learn more about who we are by visiting the About Us page. If you’re considering having your pool demolished or removed, please browse through this website and read my Blog page, check out the FAQ’S page, and be sure to visit our Featured Jobs! I take our work very seriously and I enjoy sharing my knowledge and experiences that I feel are useful in educating my prospective clients. Drop me a message or give me a call to get the ball rolling for the removal or demolition of your swimming pool, our contact information is plastered all over this website! Demolish or Renovate? Psychology 101: If you’ve reached the point where you’re even considering exploring the possibility of demolishing your swimming pool; then it’s time. 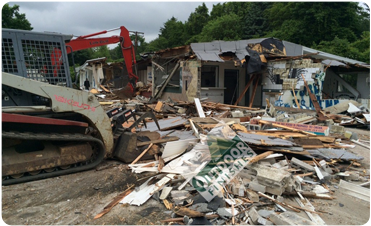 We provide quotes for folks that are conflicted between demolishing or renovating. 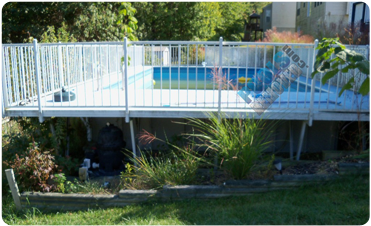 It’s not uncommon for people to go against their best judgement and take the renovating route… only to call us 2 to 3 years later for us to demolish their pool after they just spent a ton of money on pool renovations! If your mind is at the point where you’re even considering having the pool removed, then there’s your answer. Once the kids go off to college, the pool never gets used again, it sits in the backyard with the pump running for 4 months out of the year with no one using it. All pools sooner or later will need renovation work. In most cases it costs less to demolish a swimming pool than it costs to renovate. Long term, it costs less to demolish a swimming pool than it does to continue to maintain and operate a pool on an annual basis. Many people buy a home with an existing pool they do not want. Often times people are looking to sell their home and want to get rid of that old pool before they put it on the market. Does any of this sound like YOU? You’re not alone! Thousands of people every year make the decision to get rid of their pool or tennis court. We can make the process quick and painless. 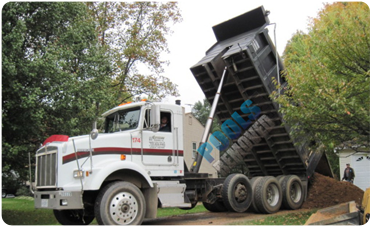 We handle everything from the demolition, backfill, and final grade. Removing your swimming pool is our specialty; just sit back and watch your headaches disappear. Outdoor Finishes makes your job a priority and typically finishes the job – start to finish – in 5 working days. We’ve heard many different reasons why folks want their swimming pool or tennis court gone – lack of use, repairs, remodeling, maintenance, electricity costs, water costs, insurance, liability factors, or just ‘Baby Boomers,” whose children are grown and gone, and no longer have any use for the pool or spa. We work with a lot of people that just bought a home with an existing pool that they have no use for. Many times folks will want to sell their home with an old, worn out pool in the backyard and the realtor will advise them to remove the pool before they list the house on the market. With today’s costs of remodeling a swimming pool, it will – in most cases – cost less to remove the pool. In the long run, the cost to demolish your pool would be considerably less than continued annual maintenance and repair costs. Our company provides property owners with a detailed, written proposal. We have experience in concrete, gunite, fiberglass, vinyl liner, and spa demos, as well as the removal of tennis and sport courts. Serving all of MD & Northern Virginia. We try to steer people away from simply “filling in” the pool as this could potentially lead to problems down the road. Outdoor Finishes removes above-ground swimming pools. Outdoor Finishes can demolish / raze houses and other structures. 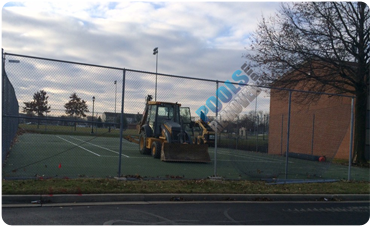 Outdoor Finishes is the leader in residential and commercial tennis court removal and demolition. Specialists in the Removal & Demolition of all Types of Swimming Pools and Tennis Courts.